I'm not sure about this next young one... some kind of thrush... Swainson's? This Red-breasted Sapsucker was really dull in color, probably the least bright one I've ever seen. I was at Wapato this weekend and i was able to locate three Red-eyed Vireos. I got there at dawn, just after six, and found all three by their vocalizations, and only got to see one of them. By eight o'clock they were undetectable. I found the same motley crew of rag-tag birds as you. Some were in such bad shape or unfamiliar plumage that i couldn't identify them. But i think you nailed all of the id's in your pictures. Your dragonfly is a male Eight-spotted Skimmer, and the butterfly is a Woodland Skipper. Not sure about the bugs though. Great shots of the young birds! Great shots of all the juveniles. 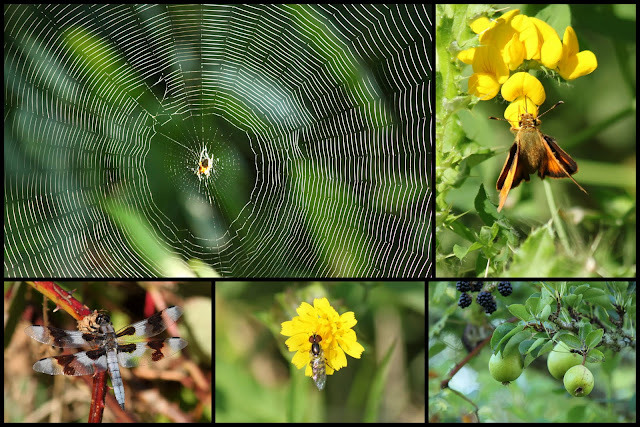 I love the neat looking spiders web and the dragonfly looks similiar to one I saw this past weekend. Sorry you missed the Vireo's. Happy Birding! Good birding, Jen! Your I.D.s are quite correct. The vireos are around, but in such low numbers that they may be easily missed if not vocalizing. I hope you caught some Garter Snake glimpses as well. They're quite abundant at this location. I also recommend birding here in winter. It's full of good sparrows, raptors, and waterfowl. Eurasian Wigeon is pretty much a guarantee, Common Teal a possibility, and I even saw Common Goldeneye out there last year. YOU do a great job with your ID's on the Imm. birds!! Great BIRD shots and I enjoyed that collage too!! Nice! I like all the insect photos. Especially the trippy cobweb. Aren't juvies fun! Adds some excitement in the summer.